This makes for a fascinating course, where you learn so much more than the words on the page. Melanie has a unique proﬁle as she delivers high powered consulting alongside her active training and leadership roles. This ensures that each assignment or course is delivered with passion, energy and focus that only a true practising professional can offer. Incorporating latest innovations and practical techniques, clients and delegates can be confident that they will find immediate use of the knowledge shared in their operational environment. Increasingly the worlds of Agile Project Management and Change Management are aligning to produce an Agile Change Management solution. Understanding activities for effective change management and including them in your Agile project plan increases the chances that the deliverables from your project will be adopted as new business as usual working practices. These change management activities build collaboration between the project team and those who will use what the project creates. In Agile terminology this is referred to as a ‘one team culture’ and these culture integration aspects of working together and sharing the responsibilities for successful project delivery and creation of transition plans are core to the APMG Agile Project Management Practitioner course. To develop your Agile project management skills, the APMG course contains a simple, intuitive lifecycle model aligned to Agile principles and the Agile Manifesto. The Agile techniques can be used to manage the work for the creation of the project deliverables and to develop the activities to help users implement these deliverables and create new ways of working. These skills also align with the Change Management Practitioner course to create a complete understanding of delivery of successful changes. Agile project management is based upon the core principle of creating small, incremental changes and getting these into use as soon as possible, so that the organisation can realise benefits early, achieving rapid return on investment. This is one of the reasons why Agile project management is so popular, because early delivery from projects and early creation of benefits is what is demanded by senior management in a fast moving and highly competitive world. It is a way of testing the usefulness and relevance of the planned project deliverables, as early delivery generates early feedback from users on how things are working in practice. If their feedback is positive, it strengthens the motivation of the project team. If their feedback is negative, it gives the team the opportunity to change what they are doing. This flexibility is a highly sought after competitive advantage, as it creates a business ethos of customer responsiveness, prioritizing those project deliverables that are the most value to those who will use them. 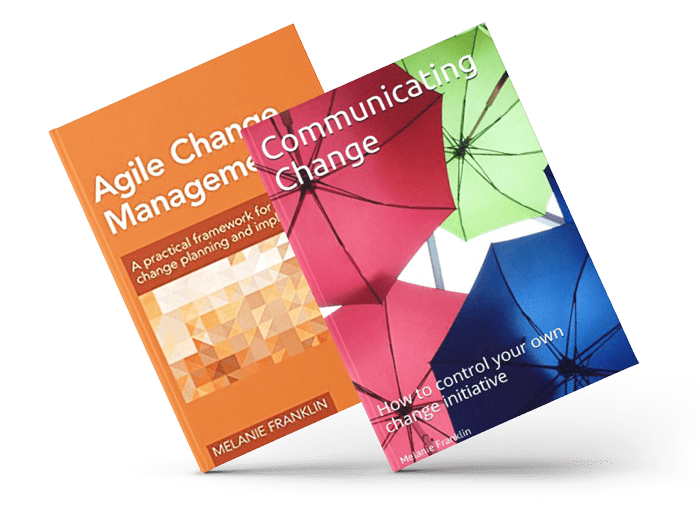 Melanie Franklin is a highly respected thought leader in change management with an impressive track record in the successful realisation of business change programmes across public and private sector organisations. An impressive array of clients have beneﬁted from her unique insights into change, including GSK, HSBC, United Nations and International Red Cross. She is the author of several publications and a regular keynote speaker at various conferences worldwide.